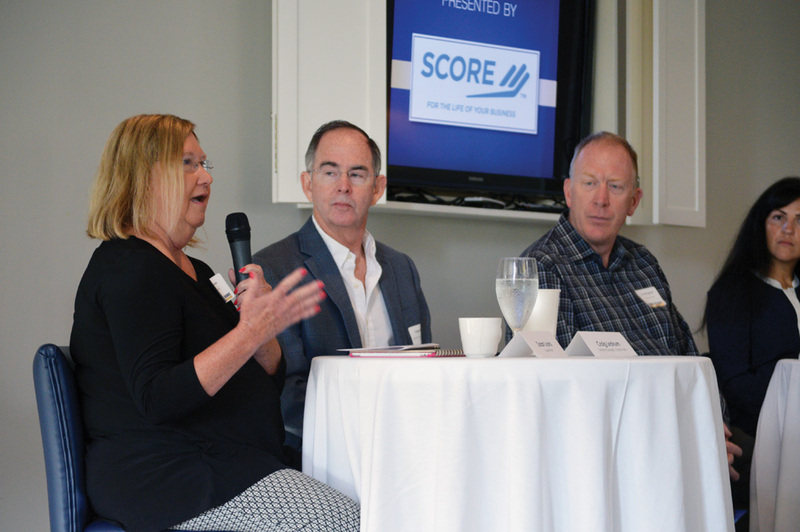 A panel comprising local business owners shared their stories of what it takes to adapt for survival in today’s economy and markets during an event held by the Bethany-Fenwick Chamber of Commerce and SCORE at the Den at Bear Trap Dunes on Thursday, Oct. 4. Susan Lyons addresses the crowd at the SCORE event. 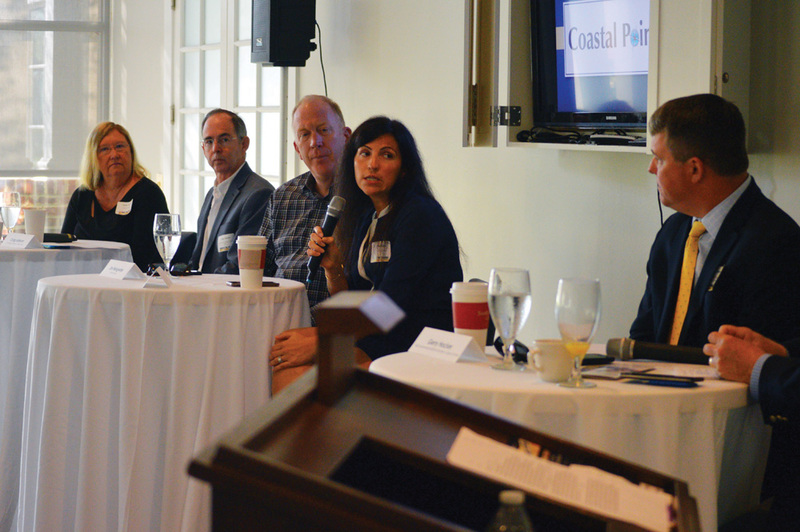 A panel of local business owners shared their success stories and insights for surviving a changing and competitive market on Oct. 4 at the Den at Bear Trap Dunes. The five panelists were Kami Banks Kane of Banks Wines & Spirits; Gerald “Gerry” Hocker Jr. of Hocker’s grocery and hardware stores; Craig Lednum of Creative Concepts home furnishing; Susan Lyons of the Coastal Point newspaper; and restaurateur Jim Weisgerber of Bethany Blues and more. The event was cohosted by SCORE (originally, “Service Corps Of Retired Executives”) of Delaware, a nonprofit whose “mission is to help businesses grow in whatever they need in help and guidance,” said the group’s Len Kidwell. So how does a small business survive, compete and thrive for 15, 20 or even 40 years? In short, the panelists said: Find and retain good employees, and adjust the product to the changing times. They all agreed that employees are key. Even during the busy times, employers need to make staff feel appreciated, they said, since that carries over into their treatment of customers. Some of the businesses offer profit-sharing, while others have strong healthcare benefits or offer bonuses. They allow flexible hours when possible. Diversifying a business can also keep things afloat during the hard times. The Hocker’s grocery store group began with an uncle’s little shop in 1947, leading to today’s Hocker’s Supercenter and G&E grocery and hardware stores. The family sells groceries; rents billboards; owns a trailer park, RV storage and car wash; has a barbecue food struck; and sells hardware. “It’s important to keep your eye on the general economy, where’s it’s headed, locally and nationally,” agreed Lednum. His parents founded Creative Concepts in 1973. It evolved from just window treatments and accessories to offering complete home furnishings and design services. They have weathered four recessions, which Lednum said sometimes meant uncomfortable decisions, including cutting hours, benefits or even employees. With their competition now being the entire internet, Lednum said Creative Concepts builds personal relationships with employees, clients, other businesses and vendors. Now, they try to extend their relationship outside the store, to engage in community events such as wine dinners and fundraisers. Success comes down to “karma,” building a good team, helping them be successful and then reaching out to the community, Lednum said. For instance, advertising has changed dramatically, but a good advertising representative might recommend several types — not just one product, said Lyons, who oversees the Coastal Point newspaper, as well as Delaware Seaside Bride magazine, the Explore Coastal Delaware mobile app and more. “We’ll do whatever we need to do to help you succeed in your business. It’s all about us working together. … Everybody here faces competition, but we’re a community, and I feel like it’s important that we all work together,” Lyons said. “Any business is about three months from being out of business without your local loyal clientele that supports you, day in and day out,” said Hocker. For Hocker’s, the 2010 arrival of Harris Teeter started off the most critical years for his family’s grocery business, as the Ocean View region was then brimming with five supermarkets — more than other local beach towns. “We stand to lose everything that we have built up,” Hocker said his father, Gerald Hocker Sr., told the family when the shiny new chain store at a busy crossroads threatened his long-running but tucked-away Ocean View location. So they doubled down on the “old country store” feel, with custom meat-cutting, a smoke shop, catering, fresh produce and more. They even changed their circular sale dates to fit a different newspaper’s publication date. “Our most competitive strategy with Harris Teeter came before they ever came,” the younger Hocker said. The Hockers’ accountant crunched the numbers up and down, from local population figures to overhead costs, he said. “‘My conclusion is: They need 100 percent of your grocery business and your hardware business and your deer-cutting business — and they don’t cut deer, and they don’t have a hardware store,’” Hocker recalled the accountant saying. That gave the family confidence that they’d survive by diversifying. The accountant made another recommendation: “‘Offer them to come in and open your books,’” Hocker recalled. The corporation politely responded that they’d be in touch, but they never came, he said. Instead, they broke ground — and closed four years later. “I’ve not ever shared that with too many people,” said Hocker, whose family later purchased the vacant property and expanded their Ocean View grocery store in a building that was almost immediately ready to re-open under the Hocker’s name. Bethany Blues has evolved the idea of branding and using web videos to tell more of their story. Coastal Delaware is a great place to do business, all panelists agreed. But should an entrepreneur open a second branch to the area or move a business there altogether? That depends on the business and whether the clientele are willing to move, too, the panelists said. The clientele changes from town to town, said Banks, discussing plans for a Long Neck expansion. The panelists agreed on the value of retirees as part-time employees, saying they are eager to do interesting work that fills their time, but not necessarily requiring a competitive wage. One woman who recently moved to the shore said it seems hard for 30-somethings to integrate into such a close-knit community. She asked how the panelists reach and retain young professionals. Some panelists said they use internet postings to find new staff. Meanwhile, restaurant work is attractive for young people until they want to settle down with “normal” hours, and most college graduates aren’t looking for grocery-store work. Small professional offices with good retention, such as Lyons’ newspaper, might only hire new staff once a year. The panelists puzzled a little over an access point for young professionals to break in to a career. The panel also described ways to reach non-residents, such as email lists, strategic publications and advertising opportunities. More than 300 SCORE branches provide free and confidential advice for entrepreneurs and existing small businesses. It’s a resource partner with the U.S. Small Business Administration (SBA), through mentoring, in-person workshops and online educational resources. SCORE is online at https://delaware.score.org.